This is a hidden coupon available on Pampers Canada’s website. Visit Pampers Canada and go to the bottom where you can visit Pampers Portal on Brandsaver.ca. Since this is mostly a babies portal, not too sure why there is a Crest Pro-Health toothpaste coupon on it as well, but it might just be for the mommies and daddies who also need to brush their teeth. 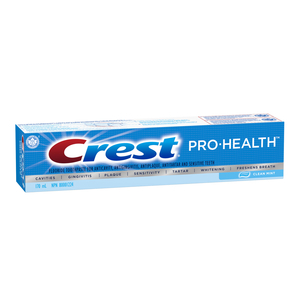 This is a Crest toothpaste coupon to Save $1 when you buy any Crest Pro-Health Toothpaste. Crest Pro Health Whitening Gel Toothpaste helps reveal your natural white smile. Its whitening ingredients effectively clean surface stains and remove unwanted buildup while brushing. Crest Pro Health Whitening reduces surface stains and helps prevent new stains. Crest Pro Health’s clinically proven active ingredient protects against gingivitis, plaque, cavities and tooth sensitivity, and reduces tartar.